O Come, All Ye Faithful. So: something traditional, something new, something for everyone. 2015/2016 Season Ticket: £65.00 Concession ticket:£50.00 available to unwaged members of the audience Our Season Ticket covering 11 concerts within the Season from 26th September 2015 to 9th July 2016. Excludes The Sixteen Concert on 18th September 2015 and Dickensian Christmas 12th December 2015. 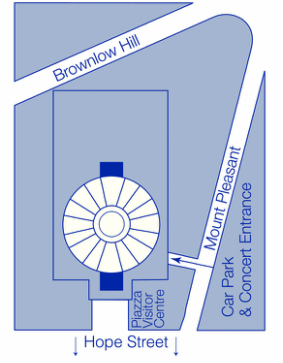 Parking The Cathedral Car Park accessed from Mount Pleasant is under the cathedral with direct access to the concert venue by lift or stairs. Limited capacity on a first come first served basis. A charge of £3.00 is payable on arrival.